Hardly any team will be busier than the Ottawa Senators before Monday's 3 p.m. ET trade deadline. When The New York Rangers dealt Michael Grabner to the rival New Jersey Devils on Thursday night, it was like an opening bell was rung for the NHL trade market. There had been a handful of smaller deals already, including The Florida Panthers' acquisition of Boston forward Frank Vatrano earlier the same day, but a team in playoff position like New Jersey picking up a speedy scorer like Grabner showed there are clubs looking to take serious steps ahead of Monday's 3 p.m. ET trade deadline. Some of the bigger names likely to go in the next few days are from the Rangers, who issued a surprise statement recently asking fans to be patient because trades were in the offing and familiar faces may be on the move. They had already sent defenceman Nick Holden to Boston for rearguard Rob O'Gara and a third-round pick on Tuesday. Defenceman Ryan McDonagh, the team captain, as well as star left winger Rick Nash are among those expected to change teams. Even popular winger Mats Zuccarello's name has been mentioned. All the Rangers are on edge, waiting for the deadline to pass. "Obviously no one in here wants to be traded but you have to be a professional," Zuccarello said this week. "We're all human beings so it's hard not to let it get to us. "You think about it at night and you think about it during the day. What's going to happen? A lot of people have been here for many years and have a strong relationships and friendships. It's going to be tough if something happens, if you're going to be gone or whatever. But it's nothing we can control right now." As with many players slated to be traded, McDonagh and Nash are both eligible to become UFAs this summer. McDonagh's solid play in his own zone would make him a fit for the Tampa Bay Lightning, but there are likely a handful of teams interested. McDonagh is currently out with an upper-body injury but is expected back any day. Nash may not be quite the goal-scoring threat he once was, but his 18 goals in 60 games this season suggest he can still help a team with Stanley Cup hopes. Nash and Grabner were held out of a game Thursday night in Montreal, apparently because deals were in the works. Other impending UFAs who may move include Buffalo left winger Evander Kane, Detroit defenceman Mike Green, Vancouver left winger Thomas Vanek, Montreal centre Tomas Plekanec and two Edmonton Oilers —centre Mark Letestu and left winger Patrick Maroon. 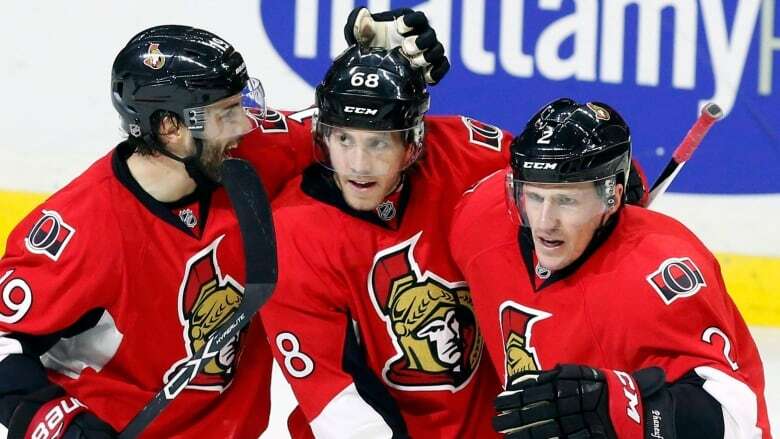 After the Rangers, no team is likely to be busier than the Senators, who have been dealing since Nov .5 when they sent Kyle Turris to Nashville and got Matt Duchene in a three-team, multi-player transaction. They also shipped defenceman Dion Phaneuf to Los Angeles in a four-player deal on Feb. 13, two days before sending Chris DiDomenico to Chicago for Ville Pokka. Most of the suspense surrounds Senators captain and star defenceman Erik Karlsson, who has one more year on his current deal but may be seeking more than Ottawa is ready to pay when his contract expires in 2019. Any move involving the two-time Norris Trophy winner would require a massive return in draft picks and players or prospects. Ottawa defenceman Johnny Oduya, an impending UFA, may also move. There has also been speculation that Montreal may move its captain, Max Pacioretty, who has a year left on his deal. The Canadiens desperately need a first-line centre. The Lightning are loaded with top prospects to deal and are reportedly looking for an experienced defenceman to play on the left side with Victor Hedman. McDonagh, Green or perhaps Jack Johnson of the Columbus Blue Jackets would fit that description. The Toronto Maple Leafs made two minor moves to get under the limit of 50 contracts per team, opening space for a trade that would likely be for a defenceman and involve the same targets. Boston also reportedly wants blue-line help. The Predators have Cup ambitions after reaching the final last season and would probably like to add a scoring forward. And who knows what the Golden Knights may want, after already shocking the league as an expansion team with a roster of cast-offs. Goalies have already been on the move, with Detroit sending Peter Mrazek to Philadelphia for two conditional picks on Monday and Darcy Kuemper leaving Los Angeles for Arizona in exchange for forward Tobias Rieder and goalie Scott Wedgewood, who was put on waivers Friday.